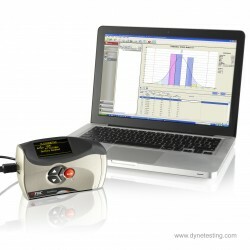 Dyne Testing offers portable precision gloss meters for production and laboratory. Suitable for paint and coatings, plastics, automotive parts, flooring, paper, packaging material, ceramics etc. In definition, gloss is a measure of the proportion of light which has a specular reflection from the surface. The variables that affect gloss are the refractive index of the material, the angle of incident light and the surface topography (structure/smoothness/roughness). Materials with smooth surfaces appear glossy, while rough surfaces reflect no or little specular light and therefore appear matt or flat. In order to get the best stability the gloss meter’s unique double frame system has been engineered with the highest precision. Carefully controlling the interior of the light patch helps to give the gloss meter robust and stable structure. Each gloss meter is a solid well-engineered product. To assess the quality of the gloss meters thousands of readings on certified substrates have been taken to test stability, reliability and durability. With or without shock testing the each gloss meter proved to have the ultimate level of performance. The Sologloss measures 60°, the Duogloss 20°/60° and the Polygloss 20°/60°/85°. The 60º angle can be used for any surface, from matte to glossy. For better measurements on high gloss surfaces the 20° angle is available, while for low gloss surfaces the 85° angle suits best. The 60° single-angle Sologloss instrument is the preferred instrument for measurements in the semi-gloss range. Suitable for most applications, light source and detector are positioned under an angle of 60° of the surface to be measured. 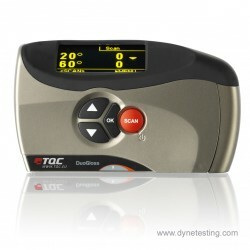 This model is a versatile instrument that combines the 20° and 60° angle into one gloss meter. The 20° angle is ideal for measurements in the high-gloss area while the 60° covers the semi-gloss range. 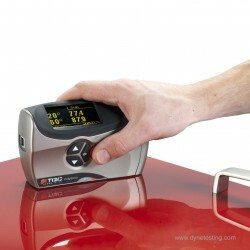 The top of the range Polygloss meter is a triple angle instrument. Besides a 20° and 60° measuring angle it is also equipped with a 85° measuring angle thus covering the entire gloss-spectrum. The 85° is for low gloss levels (high diffuse reflection) or matt surfaces. Ideal Finish Analysis Software is included to analyze the measurement results. This software gives the user the power to do all analysis of interest. Trend, Gaus and many other statistical evaluation are possible.